Biochemists focus on the chemistry of life. The biochemistry major provides knowledge in chemistry, biochemistry, and biology which will prepare you to consider real-world problems from a variety of perspectives. You will be able to immediately contribute your skills in corporate, health care, or government positions. You will also be ready to enter professional education in medicine or other health-related fields or attend graduate programs in a variety of chemical and life sciences related programs. Biochemistry majors often have an interest in combining the life and health sciences with a chemistry degree. Students take a year of general biology in addition to a typical chemistry curriculum. During the upper-level years, students take a substantial core of courses in biochemistry, physical chemistry, the liberal arts, and elective courses in life sciences. Students must take a minimum of two upper-division biology electives. The biochemistry program has been approved by the American Chemical Society (ACS). Employment opportunities for biochemistry students are available in the chemical, pharmaceutical, agricultural, forensic, and rapidly expanding biotechnological fields. Students also are well-prepared to enter advanced degree programs in biochemistry, medicine, pharmacy, dentistry, and veterinary medicine. The biochemistry major may be completed in four or five years, depending on the amount of cooperative education each student elects to complete. Co-op may begin the summer after the first year. Students may complete the BS degree requirements in a traditional four-year program with three summers of co-op. Students who choose to complete co-op requirements during the academic year may be required to extend their studies. Pannullo is the first hard-of-hearing student at RIT to be recognized as a Barry Goldwater Scholar. It is the highest undergraduate award of its kind for the fields of the natural sciences, math and engineering. This course introduces first-year chemistry and biochemistry majors to the topics of chemical safety, ethics, database searching, citation protocol, presentation development and execution as well as the career options in the field and opportunities at RIT and beyond. These topics will be covered in the context of developing a product that the student will accomplish during the lab component of the course. An accelerated entry-level course designed for chemistry and biochemistry majors. Topics include measurement, atomic theory, chemical bonding and structure, stoichiometry, equilibrium and acid-base chemistry. This course presents an introduction to working in a modern chemistry laboratory. Students will perform exercises that will aid in the understanding of general laboratory practices, atomic and molecular structure, and Lewis acid base theory. Students will also become familiar with keeping a scientific laboratory notebook and writing scientific abstracts. Students will also utilize modern chemical instrumentation to aid in the understanding of concepts. This course is a rigorous study of the structure, nomenclature, reactions and synthesis of the following functional groups: alkanes, alkenes, and alkynes. The course will also provide an introduction to chemical bonding, IR and NMR spectroscopy, acid and base reactions, stereochemistry, nucleophilic substitution reactions, alkene, and alkyne reactions. This course will require the use of mechanisms in describing and predicting organic reactions. This course prepares students to perform techniques important in an organic chemistry lab and to carryout reactions covered in the accompanying lecture CHMO-331. This course is a comprehensive study of the structure, reactions and synthesis of the following functional groups: aromatic rings, ketones, aldehydes, and carboxylic acids and their derivatives. Students will apply their knowledge from CHMO-331 to predict products and derive mechanisms that describe various organic reactions. This course teaches students to perform techniques important in an organic chemistry lab and reactions covered in the accompanying lecture CHMO-332. This course will also help students to solidify the concepts taught in lecture and perform qualitative analysis of unknown compounds. Students are expected to do significant work outside of lab. This laboratory is designed for chemistry and biochemistry majors or those interested in pursuing a minor in chemistry. Experiments include statistics, calibration of equipment, spectroscopy, volumetric analyses, kinetics, Gran Plot, double endpoint titrations, potentiometric titration, photometric determination of copper, and water hardness. This is an advanced course on a topic that is not part of the formal curriculum. This course is structured as an ordinary course and has specific prerequisites, contact hours, and examination procedures. This course provides a laboratory environment for students to learn the strategies necessary to synthesize a wide variety of inorganic compounds and organometallic complexes. Students will learn how to plan and develop synthetic protocols in both atmospheric and inert reaction processes. This course is intended to give an opportunity to develop innovative skills and writing proficiency. Library, literature and textbook research will be required. This advanced lab course teaches students to perform advanced techniques important in an organic chemistry lab. Techniques covered include working under inert atmospheres, working with air-sensitive reagents, using syringes, purification methods, and carrying on material for subsequent synthetic steps. Characterization of synthesized compounds will be conducted. 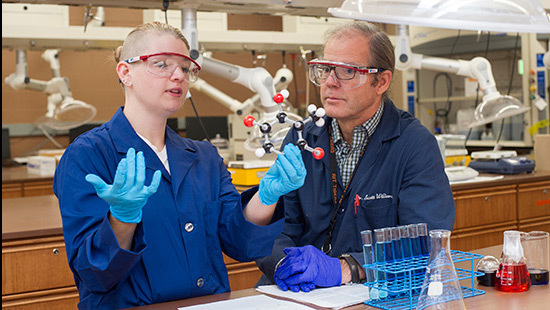 Students are encouraged to meet the professors in the School of Chemistry and Materials Science early in their time on campus. Many of our students join research labs and engage in research starting as early as their first year. Participation in undergraduate research leads to opportunities to make presentations at local and national conferences. Many of our student researchers also become contributing authors on peer-reviewed manuscripts.